﻿The Gonzales Master Gardeners are people who love gardening and want to learn more about horticulture. Master Gardeners enjoy sharing their plant knowledge with others and promoting the love of gardening. What really sets Master Gardeners apart from other home gardeners is their special training in horticulture. 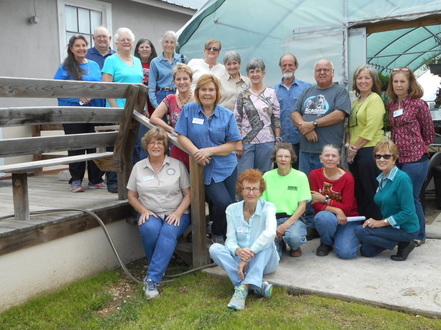 In exchange for their training, persons who become Master Gardeners contribute time as volunteers, working through the Texas AgriLife Extension office to provide horticulture-related information to the community. You can find out what’s happening in the Gonzales Master Gardeners and learn more about our activities as an organization by clicking below. Donations that support our efforts on behalf of Gonzales County and Texas AgriLife are always appreciated! Thank you everyone who came to the March 16, 2019 Spring Plant Sale. Your support will continue Gonzales Master Gardener's projects and programs for the community. We really appreciate you and will continue to bring you current knowledge and information about gardening and horticulture practices. Our Master Gardeners really enjoy sharing this information with the public and are always willing to help you. See you in the Fall for our Fall Tree and Plant sale.